Soft yet durable gel toe separator gently realigns your big toe, allowing you to stand or walk for longer in comfort. You can finally achieve that therapeutic pain relief you desire. These Toe Stretchers and Toe Straighteners are not only comfortable and waterproof, they can be used anywhere you can kick off your shoes and relax. Can kill the fungus bacteria and viruses, helping to remove the onychomycosis without binding up and nail removal, easy, safe and convenient. Net Content: 5ml. Enhance nail gloss and promote the nail growth. Quantity: 100pcs. - Easy to apply and hold with nail glue. - You can add nail art decorations on your fingernails and design your own style and pattern. Style: French. sincerely hope that you can understand! 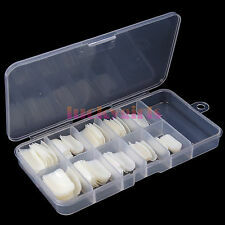 Nail Separators Stretchers Loop Bunion Splint Straightener Toe Straightener. Reduces toe and foot discomfort. Material: Silica Gel. If item is defective after 3 months, you can still send it back to us. You can follow below process to chontact us. Color：as the picture show. Import Duties. GBP 1.42 1 sold. Can be used with gel nails & acrylic nails art designs. Model : E-6813A. 10 Choice!! Perfect Decoration For Valentine's Day!! Wash your hands and feet before using the product,after drying, apply the product directly to the nail area, and dry it once after each application. Suitable for people with nail problems. Net Content:10ml/0.34 fl.oz. 2PCS Little Toe Straightener Separator Valgus Splint Guard Corrector. 1 Pair Toe Separators (2PCS). Soft cushion, comfortable to your foot. Perfect to keep your toes in aligned position. Note: The real color of the item may be slightly different from the pictures shown on website caused by many factors such as brightness of your monitor and light brightness. Designed for people who suffer from the hallux valgus. It can relieve pain from bent toes, overlapping toes and hallux valgus. Hand wash gently with clean water, dry naturaly. 2Pcs x Fabric Gel Tube. Soft fabric sleeves breathe and easily stretch for a custom fit. Color: khaki. Instantly cushion and protect corns to help relieve pain. Item type: toe protector. Material: fiber silicone. Anyway we will try our best to avoid this kind of thing. High penetration, no irritation, accelerate regrowth of nail or toenail. 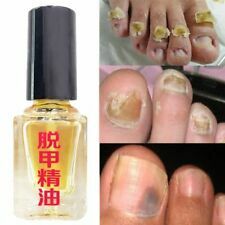 Item Type: Anti Fungus Nail Liquid. 1x 3ml Anti Fungus Nail Liquid. Small bottle, brush design, easy to carry and simply to use. Suitable for flatfoot, talipes cavus, varus, valgus, heel pain, tendon pain and forefoot pain etc. Water drop shaped design with elastic and air cushion. Material: soft gel silicone. Enriched with mineral oil & soothing aloe vera which prevents friction & pressure around the bunion joint. Color: white. 9 pcs x Corn Plasters(other accessories demo in the picture is not included. Corn pads reduce friction and pressure on painful calluses. Shape: Oval. Color: Pink(Due to the difference in raw materials produced by the supplier, there will be color difference between orange and pink in each batch of products. ). Wide Application: One size fit most feet. Can effectively prevent shoes slipping, callus growth, forehead pain and so on. Comfortable and soft. - Material: Silicone. We will get back to you as soon as we are available. 3 stick to use until a smooth fingernail is grown. We will try our best to reduce the risk of the custom duties. How to use. 4x 350ml Lotion Pump Bottles Shampoo Atomizer Travel Containers White. Multi-use: Finger press flip disc lid easily dispense aromatherapy essential oil blends, mouthwash, body wash, shampoo, conditioner, lotion, hand soap. Instantly cushion and protect corns to help relieve pain. Item type: toe protector. Material: fiber silicone. Anyway we will try our best to avoid this kind of thing. Soft fabric sleeves breathe and easily stretch for a custom fit. The second stepBefore use, shake the bottle before, even under the syrup, then put on droplets in a disease (of course, if your illness is very thick armor, the most. 1 x Nail Care Essence Oil. A pull avoid pain. ). Flip-flop toe Separator Half Insoles. 1 Pair of Flip-flop toe Separator Insoles. then Insert and attach a piece of insole to front of each flip-flop. Material: Silicon Gel. Reusable: hand wash with warm water and soap, then air dry.